DENVER — There was a time not long ago that basketball success in the Rocky Mountains was measured by the Denver Nuggets’ ability to persuade a free agent of Dwyane Wade’s stature to meet team brass in New York and let the Nuggets offer him millions. In the summer of 2016, only one season into the career of Nikola Jokic and with few hints to that point that the Nuggets already had a cornerstone player, just getting the opportunity to pitch Wade face-to-face was widely hailed as a triumph for this franchise. What went unrevealed that off-season is that Denver also made a futile run at Wade’s longtime rival, Dirk Nowitzki of the Dallas Mavericks. Nowitzki had no interest in even entertaining the idea of leaving the only team he had ever known, but that was the Nuggets in the embryonic stages of Jokic’s development — straining to persuade some of the game’s biggest names to take them seriously. Three years later, Jokic is a certifiable All-Star and his team of upstarts from the Mile High City found an entertaining way on Tuesday night to win some leaguewide notice. Seemingly headed for a second consecutive playoff defeat to the San Antonio Spurs on its home floor, Denver rode a remarkable fourth-quarter resurrection from the third-year guard Jamal Murray to rally to a 114-105 victory over the Spurs that did far more than even this Western Conference first-round series at one game apiece. Millsap’s candor conveyed a good chunk of the significance attached to this win, but not all of it. Murray’s eruption for 21 of his 24 points in the final period — on 8-for-9 shooting after he stood at 0-for-8 through three quarters — not only gave the hosts hope of making this an actual series but also spared them some real embarrassment and introspection. After five consecutive seasons out of the playoffs, Denver unexpectedly won 54 games this season to vault to No. 2 in the West. The Nuggets were nonetheless a trendy pick to suffer a first-round upset against the San Antonio masters of execution and their coaching maestro, Gregg Popovich, which would naturally render Denver’s regular-season accomplishments rather hollow. “Frauds” was the popular word being tossed around on N.B.A. Twitter after the Nuggets fell behind by 19 points — twice — in a must-win game. Booing broke out at Pepsi Center on multiple occasions in just Denver’s second home playoff game since 2013, with both Jokic and Nuggets Coach Michael Malone telling reporters afterward that the fans were too hard on Will Barton when they hissed at his 1-for-10 shooting. “When they’re going through a tough time, they could use some love,” Malone said of his players, who comprise the league’s youngest playoff roster. 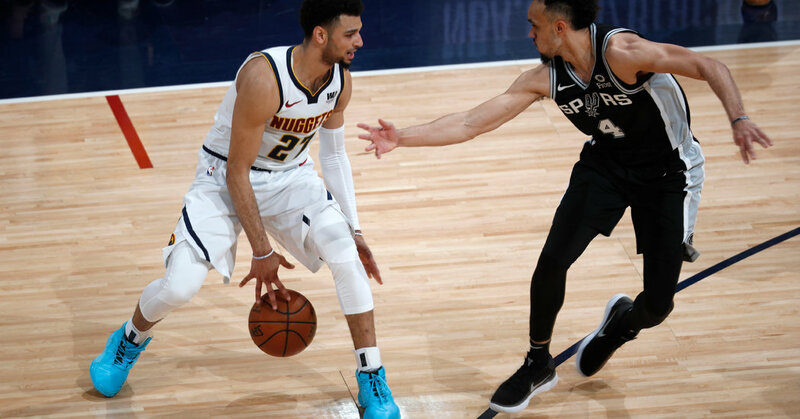 Fortunately for Barton and the rest of the Nuggets, it was all love in the fourth quarter, thanks largely to Murray, who shot 8-for-24 in Game 1 — including a wide-open elbow jumper he clanked in crunchtime that clearly haunted the Canadian guard well into Game 2. During one key timeout, Malone reminded his players “what the Clippers did” Monday night, when they rallied out of a 31-point deficit in the second half at Golden State to register the largest playoff comeback in N.B.A. history. The inspiration finally hit Murray in the fourth when, without warning, he drained his first eight shots. In support of Murray, Jokic rang up 21 points, 13 rebounds and 8 assists in a bid for a second consecutive triple-double, which would suggest that the Serbian big man is coping quite well with his first turn under a playoff microscope. Gary Harris and Millsap added 23 and 20 points, to give Denver four starters in the 20s. The collapse was even worse than Popovich realized. The Spurs actually allowed 39 points in the quarter — and San Antonio’s All-Star forward, LaMarcus Aldridge, could be subjected to some league discipline that affects his status for Thursday night’s Game 3 judging by video footage in circulation that appears to show Aldridge landing a below-the-belt shot on Harris. Not that the Nuggets, after days of hearing incessantly about how inexperienced they are, can feel any sort of comfort yet. They’ve lost 13 consecutive games in San Antonio dating to 2012. Denver is also 0-11, as a franchise, in best-of-seven series after losing Game 1. “I think the cynicism is fair,” Nuggets General Manager Tim Connelly said after the victory, acknowledging that he was well aware of the noise about his team. Yet Connelly pointed out that as fluky as skeptics might find the Nuggets’ No. 2 seed, team officials set three fairly lofty goals before the season started and then watched this group reach them all. End the playoff drought? Check. Win the Northwest Division? Check. Secure a top-four seed and home-court advantage in the first round of the postseason? The next step was making sure they didn’t spoil all that by falling into an 0-2 hole to San Antonio with two home defeats, which is the sort of deficit only four teams in league history have managed to erase. Yet one of the more refreshing things about this team is that it doesn’t try to pretend that its collective lack of postseason experience is merely a topic harped on by the news media. The Nuggets have only three players (Millsap, Barton and Mason Plumlee) who appeared in a playoff game before Game 1 of this series, and they acknowledge it’s an obstacle, especially against a team that can carry out a game plan like the Spurs. “Yes, playoff basketball is everything everybody says it is,” Harris told me Monday, on the eve of Game 2. Breakthrough performances from Murray and Jokic and big comebacks, as such, must be celebrated — even at this early stage of Round 1. So in the middle of the victorious locker room, swept up in what the novices, er, the Nuggets had just achieved, Malone was duly pulled into a robust group hug by their rarely seen owner, Stan Kroenke, and Kroenke’s son Josh, the team’s president and governor.